I design and fly Model planes , and this would be perfect for attending their Fly-ins... hence it will be painted on the outside like a nose of a Jetliner... Just for FUN !!! I'll be watching since I still have to make something normal to drag around to distant places. and there's always the faux rivets and panels paint job! Long3"x3" nose beam will be shortened about 4 feet ... That's all for the mods as everything will work out fine ... and it's galvanized so I won't have anything to do other than keep it clean ... Cool ...Easy !!! when the "box" sits on the frame, will the rear - uh... "spoiler" for lack of a better name- be over the tenant's head for rain protection or at eyebrow level...? inquiring minds wanna know! 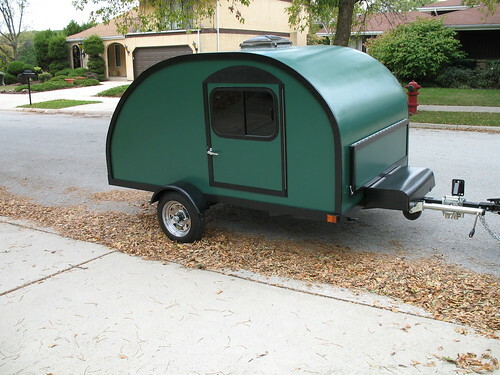 I really appreciate the beauty and craftsmanship that goes into some of these TD 's , but gotta' keep it "plain " for around here... Do you guys even care for the "simple trailers"?????? the more simple the more better. i like the lego avatar! very nice profile a strange fealing to see i have telephatique powers. look at my album!!! Lulu... Love to see the album ....but where ???? looks like we dodged the bullet again , with Ernesto ... still packed , ready to leave ....Good to have a TD !!!!! MJ , It should be , but ALL my text is WIDER than my screen ...One of those Mac guys ya' know ...But only on this site ...???? I dunno' ?????? Didn't get the trailer pic done yet (charge batteries) , but did a side view plan of the Airliner...but unfortunately , my scanner finally decided to go South for the last time .... it was on it's way to the trash can anyway , but couldn't get the new one running cause I can't find mac OS X 10.2 ... duh !!!! What a mess !!! We also have a Mac without the new/improved firewire guts. You're looking to upgrade to OSX.2 and I think I might have software to do so. Drop a PM this way and let's see what we can do to get you up and running again?